Born in Brunswick, and recruited from Tramways, 174cm Johnson played 77 games in Navy Blue, but did not kick a goal. 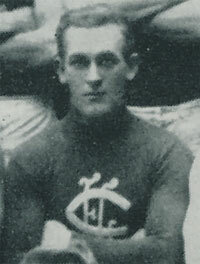 He began his Carlton career in Season 1918. Johnson passed away on the 24th December, 1956 aged 60. Contributors to this page: Bombasheldon , molsey , tmd1 , true_blue24 , WillowBlue , Jarusa and admin . Page last modified on Saturday 01 of June, 2013 21:34:11 AEST by Bombasheldon. 2013 Rd 2 - MCG; Carlton's Change Room.